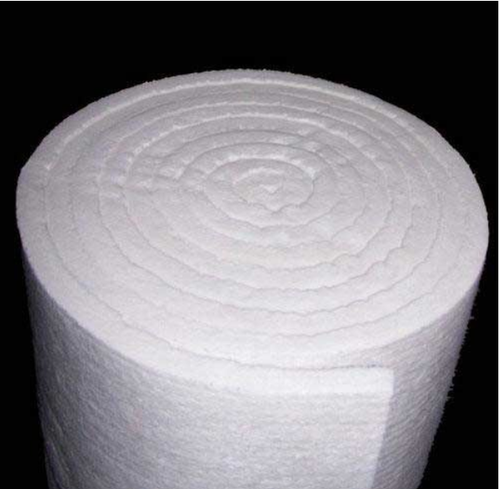 We are providing high quality range of Ceramic Fiber Blanket. This range is made from high quality gao ling clay, high purity alumina and silica oxides by spun or blown process. It is asbestos free. No chemical binder is added. Double size needling provides blanket with great tensile or handling strength for easy installation. Blanket is available in various classified temperature from 1260º C to 1430º C. Our range is is resistant to most chemicals attack except hydrofluoric Phosphoric acid and high pH alkali (Na2O or K2O). Its thermal and physical properties cannot be affected by oil, steam and water. It can be used to the heat insulation wrap. Our range effect of resistance for corrosion and heat insulation. It temp resistance is better than E-glass fiber products. Annual Turnover2010-11 Rs. 50 Lakh - 1 Crore Approx. R.P. INDUSTRIES is one of the most trusted and leading Manufacturer, Exporter , Supplier of Fiber Glass, Glass Wool Insulation Products & Hybrid Bonding chemicals. We commenced our business operation in the 2006 to cater Superior Quality Insulation products. Under the dynamic leadership of Mr. Ranvir Singh (having vast experience more than 30 Years in this field.). His Experience & instructions have been instrumental for the success of our organization and due to his active policy of reviewing our unit regularly, there has been drastic improvement in the field related with production and quality management system. The adroitness of the company in the specific industry, is well supported by the continuous implementation of management techniques and effective & advance manufacturing process. Our company is driven by the team of talented professionals, who expertise in providing our clients best solution for their specific requirements. We are also among a handful of companies in this sector that is mindful of the environment and social costs of manufacturing. We are based in Aligarh, on the highway leading to New Delhi (Capital of India). Quality is the main focus of all our endeavors. We procure finest quality products from the reliable and certified manufacturers from all over the country. Our products comply with stringent international quality standards and have an excellent technical properties. With over 10,000 Sqmt. of captive and distributed manufacturing space, we have a large capacity to meet our growing business needs. We use a combination of modern and legacy manufacturing techniques. We have adequate captive power supply to ensure uninterrupted operations. Our process to manufacture Fiber Glass & Glass Wool products are under constant Quality Control Checks. The strict vigil at every stage of production has enabled the company to achieve a big name as a company is creating new standard of quality. The R & D of RP Industries is committed to adapt, modify and develop the product to fulfil customer’s requirements and needs in time. The R & D centre is thoroughly equipped with ovens, muffle furnace, thickness tester, desiccators, electronic weighing machine and other testing equipments. Our R & D many a times is known for developing innovative concept into modified upgraded products. We are constantly on the lookout for new ideas to put forward the best which the industry has to offer. Our R & D department follows stringent Quality Control measures. We also ensure strict adherence to delivery schedules.